What can we do about hydrocarbon pollution? Who is doing something about it and how? Training by experts from France and the Service of Lighthouses and Buoys in Guadeloupe has increased the competence of several people on the local level, who are now capable of intervening and providing the appropriate response should a layer of hydrocarbons threaten the shores of Saint Martin. The entire staff of the Réserve Naturelle participated in this training, along with gendarmes from the nautical brigade, the SNSM, the staff from both marinas in Marigot, and personnel from the Collectivité. The prefecture and the Direction de la Mer coordinated the operation from a crisis center created for the occasion. The training, both practical and theoretical, was based on the deployment of floating barges comprised of synthetic foam, less fragile than inflatable barges, but more voluminous to store. On the practical side, the barges were successfully tested near Marina Fort Louis, but met with more difficulty in the access channel to the bridge at Sandy Ground, due to strong currents. It is important to note that this equipment will be stored in Guadeloupe, but owners of sites potentially at risk, such as fuel depots and the EDF plant, should keep this kind of equipment on hand. What happens to data stored in our computers? Where will it be in 20 years? And beyond? A big question to which IFRECOR and the government have found an answer concerning French coral reefs and the plant beds. At the end of the atelier organized in Martinique in April 2017 (see article page 21), a technical solution was provided as a new tool for managers of protected marine zones. This tool, managed by IFREMER, allows secure storage of all data collected individually, but also facilities date exchange and allows for better exploitation and interpretation of information, all on a national level. This method has been tested for a year in La Réunion and has now been launched in the Caribbean region, where this data is not necessarily the same as in Indo-Pacific region. For Julien Chalifour, this technological advance guarantees that the results of the scientific studies done for the past several years on the underwater milieu in Saint Martin do not risk getting lost, and can now be shared more easily. Our readers most likely remember that in October 2016, the Réserve placed a raft on the Grand Etang in the Lowlands, to promote the nesting of small terns, of which there were 75 on this site. In theory, this was a great idea, except there are black-necked stilts that have appropriated the space on the raft. Caroline Fleury, specialist of the land and wetlands milieu, who conceived and designed the raft, spotted three baby birds with her binoculars. The experience has proved that several species can live together on the same raft and the Réserve has not lost hope that the small tern, which is a protected species, will still be seduced by this nursery, where their eggs will be protected from a sudden rise in water levels or the appetite of a rat or someone’s pet. Urgent reminder: It is important not to let dogs roam around the edge of the ponds, in order to protects the nests and baby birds. The legal rules about the biotope forbid dogs not on leashes within the territory of the Réserve Naturelle and around the ponds located outside of the Réserve Naturelle. Thanks to the Eco- Volunteers! The report on the 2016 scientific study on the egg laying habits of sea turtles has been concluded. The 50 eco-volunteers completed 376 patrols on the beaches during the reproductive season, from April through November, and recorded 235 tracks made by turtles that came to lay their eggs in the sand, 169 of which were made by green turtles. 60% of the 235 traces were noted within two days of the turtle’s activity on the beach, thanks to the frequency of the patrols, and 53% of these sightings showed that eggs had been laid. As always, the beaches most preferred by the turtles are Long Bay (123 tracks), Plum Bay (40 tracks) and the two beaches on Tintamare (54 tracks). The results of this annual study, which was launched in 2009, confirmed which beaches are most visited by these turtles, so that the scientific team decided to prioritize the sites in a new way for the study in 2017. These results and this strategy were the subject for an evening presentation on February 14, to mark the debut of the 2017 egg-laying season for sea turtles in Saint Martin. This decision was validated during a meeting of the Council For French Shores In The Americas, held in Guadeloupe on February 1, 2017, as well as by the sites management committee for the Conservatoire. 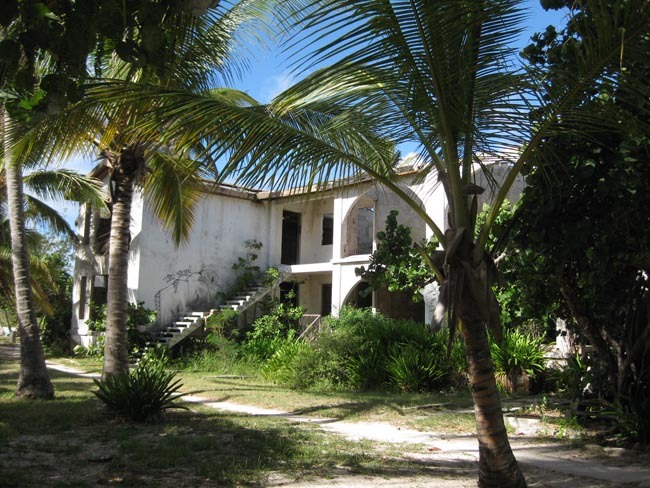 One recalls that the former owner was put on formal notice in 2016 by the Conservatoire du Littoral and asked to move from the location for having run a non-authorized commercial activity in an area classified as a nature reserve, as well as having modified the condition of the Réserve by doing work to the site. This person took his horses and moved out in January. 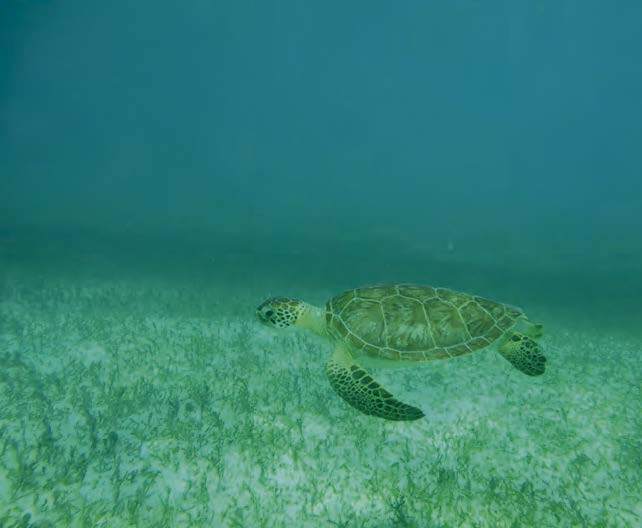 The management of the sea grass bed at Tintimare’s Baie Blanche, where green sea turtles feed, was the focus of a study done by Charlotte Bousquet, who was an intern at the Réserve Naturelle from February through June 2016. A master’s student in environmental sciences and littoral ecology at the University of La Rochelle, she started by marking a map of the herbier and evaluating its overall health. Next, she did a study on the usage of the bay by various kinds of boats, noting their size, if they belonged to an private individual or a nautical professional, and if they opted to use anchors rather than mooring buoys placed there for their use by the Réserve Naturelle. Based on her early results, Bousquet researched the impact that anchors and their chains have on the herbier, as they can leave serious scars. To do so, she identified three sectors: the zone where the buoys are placed; the mooring zone behind the buoys where certain sailors prefer to anchor; and the zone located to the south of the bay, where boats very rarely anchor. Conclusion: the overall health of the plant bed is good, in spite of the presence of small areas where anchors have more impact than others. At the same time, the practice of mooring with an anchor is more often the choice of private individuals, rather than the professionals. As for the level of usage, generally not too high, there are peaks, at which time there can be as many as 15 motorboats at the same time, but for a limited amount of time, usually the days when several cruise ships are in the port of Philipsburg. This report puts an accent on the need to reinforce the awareness for individuals and get everyone thinking about refining the usage and moorings in the center of this zone. In mid-October, the Réserve placed a raft in the water of the Grand Étang, in Terres Basses, in order to encourage resting and nesting for least terns, of which there are 75 on the site this year. The idea is to protect this migratory bird, a species whose conservation status is «endangered» on a world level and «vulnerable» on the local level. Very sensitive to disturbances, the least tern makes its nest along the edge of the salt ponds, on the sand, and its eggs and not protects from a sudden rise in water levels or a hungry rat or dog. This would no longer be the case if the birds lay their eggs on the raft, out in the middle of the pond. 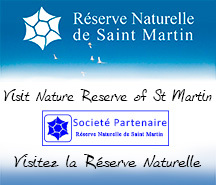 This process exists elsewhere but this is a first for Saint Martin, and the Réserve is crossing its fingers that the birds will quickly adopt this new space. That could take more or less time, such as in the Camargue, where it took three years for the birds to finally nest on their raft. Six meters long and three meters wide, this floating structure is anchored in the pond and designed for the comfort of the birds: the bottom is covered with gravel and caches are available in the interior so that the baby birds can be protected from the elements. The Les residents of Terres Basses were receptive to this project once it was presented to them by the Réserve, and they are going to participate in its financing along with the Réserve and the Fondation du Patrimoine. The staff at the Réserve built the raft, as conceived and designed by Caroline Fleury, director of the land and lakes milieu study, supervised by Julien Chalifour and the scientific department of the Réserve. Interested in standardizing the techniques they employ in order to perfect these natural resources. That is one of the reasons that the Global Coral Reef Monitoring Network (GCRMN) organized a technical atelier in Discovery Bay, Jamaica, April 17-26, 2016. Julien Chalifour, director of the scientific sector of the Réserve Naturelle de Saint-Martin, attended and met with scientists from the USA, Cuba, Venezuela, and Barbados, as well as Saba, Statia, Sint Maarten, and Saint Barth. They presented their monitoring techniques and pooled their common experiences and knowledge in the spirit of sharing. As a result, several presentations increased awareness of the actions outlined in the highly compatible protocol that has been in effect in Saint Martin since 2008. One of these activities, better estimating the transparency of the water thanks to a Secchi disk, has already been taken into consideration. The SPAW-RAC, co-organizer of the event, financed the trip for Julien Chalifour and Sébastien Gréaux, his counterpart at the Territorial Environmental Agency of Saint Barthélemy. This harmonization of methods, and the data produced, will contribute to improvement in the exchanges between the participants, as well as enhancing the global vision and overall condition of the coral reefs in the Caribbean, with an eye toward sustainable regional management. In order to decide with them on the best actions to take so that this magnificent nature site remain undeveloped but open to hikers. It was decided to create a small welcome area with informational signage and the planting of local species such as gaïac trees and Turk’s head cactus. Markers would be installed along the path to avoid having people trample the vegetation. The path will also feature botanic labels and two outlook points with the names of neighboring islands that can be seen. Members of the “Association syndicale libre d’Oyster Pond” (ASLOP) have requested that a totem pole be erected in a good spot, to add an artistic dimension to this poetic site. And this year 25 eco-volunteers participated in the second annual evening organized by the Réserve Naturelle in May. Julien Chalifour spoke about the different species of turtles that come to lay their eggs on the island’s beaches, their life cycle, and the activities instituted by the Réserve to protect them and favor their reproduction. Eco-volunteers help with this protection and regularly walk the beaches assigned to them to note the tracks left by turtles that have dug a nest to bury their eggs. It is not too late to participate! Contact the Réserve at science@rnsm.org or via the Facebook page. How to deal with sargussum seaweed without causing harm to the environment, and especially the egg-laying milieu of sea turtles? That was the theme of the training provided to the green brigades on October 21, 2015 by the scientific office of the Réserve Naturelle. The creation of these brigades responds to the problems caused by the sargassum, which led to a new collaboration between the Prefecture, the Collectivité, and the Réserve Naturelle. Two groups of 12 young brigadiers accompanied by their supervisors where brought up to speed on the most ecological strategy to collect the seaweed and dispose of it. They first learned about the biology of sea turtles and their life cycles, as well as how to eventually use machinery without destroying the turtles’ nests, and where it is best to stock the sargassum while draining it, far from the nests. Julien Chalifour explained that there are two types of algae, in which little fish, tiny shrimp, small slugs, and especially small jellyfish and other salt water organisms. It is important not to touch the animal colonies that resemble flowers, as they sting. What are there so many green turtles in Tintamare ? Because they are protected, of course, but also because they feed on the plant beds that carpets the ocean floor. That proves the importance of this ecosystem and its good management, especially the presence of 17 mooring blocks provided by the Réserve for boats to use. This herbarium is the object of a project for Charlotte Bousquet, a student at the University of La Rochelle in a master’s program for «environmental sciences and littoral ecology ». She is doing an internship at the Réserve Naturelle from February through July 2016, and began by studying and describing this herbarium, before observing how boats sometimes drop their anchors on the herbarium since the moorings are all occupied, which is not a valid reason. The core of her mission consists in determining the different way boats use three zones: the sandy mooring zone; the sandy zone behind the moorings; and the zone of the herbarium where boats sometimes drop their anchors. On the basis of the results, she will formulate recommendations for the optimum management of these three zones, in order to improve their conservation. In a global context of disappearing coral reefs, projects for artificial underwater habitats are multiplying, in the goal of developing the biomass to encourage the survival of fish and crustaceans. Invited to Saint Barthélemy in early March for the Environmental Agency for their “Ocean Week”, Julien Chalifour presented the BioHab project, established since 2014 in the waters of the Réserve Naturelle de Saint-Martin, and whose results have exceeded expectations. Five months after modules of cinder blocks were placed, 33 species had moved into the site, which was empty beforehand, and there were at least 151 individuals in 100 square meters, including 63 royal lobsters, for a density well superior to that on natural reefs! Other participants presented their projects on the theme of coral reef restoration, notably the Biorock process, whose goal is to stimulate the growth of coral by an electric current. These diverse initiatives are complementary projects over the long term to help with the maintenance and restoration of reef ecosystems. The number of green monkeys continues to increase in Saint Martin, and their presence is becoming more of an issue. 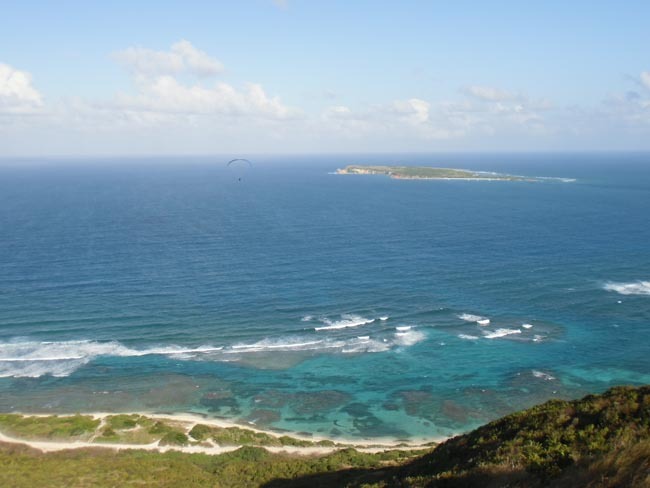 The Conservatoire du Littoral has instituted a two-phase restoration project for the Babit Point site at Oyster Pond. The first phase has been completed, with the demolition of a house in ruins and closing of the site to restrict access by vehicles. The second phase, which consists of enhancing the natural beauty of the site, will take place at a later date, in accordance with all of the residents of the neighborhood. The legal tangles in the confrontation between the Conservatoire du Littoral and the SCI Le Galion, owner of land parcel AW16 - where the ruins of a former hotel continued to decay - have reached a positive point following a price set for the sale of this land. In consequence, the Conservatoire can take possession of the site and start demolition of the ruins, which were an eyesore. This demolition project is expected to take six months with a budget of 660,000 euros. The high budget is due to the presence of asbestos in the buildings and very strict regulations concerning the treatment of this hazardous material. The call for bids has been launched: the work will begin early next year and be completed in the second half of 2016. The Conservatoire has budgeted a total of one million euros for the Galion project, and will renovate the site for use by the public, for picnics or leisure activities. The feasibility study done by the Conservatoire calls for the control of traffic, as well as the integration of a nautical base and a snack bar. Once the site is restored, in collaboration with the Collectivity, a three-party agreement will define the role of each group involved. As school children use the floating swimming pool at Galion, regulations require the Collectivity to provide a qualified swimming instructor/lifeguard. And lifeguard in the sense of rescue operations. In light of this obligation to ensure the safety of the students, the Conservatoire has authorized the Collectivity to install a light structure on the edge of the beach. A total of 54 rats were trapped in two weeks on Tintamare as well as 23 rats and 6 mice in one week on Pinel, during a special campaign to capture them held in July 2015. These numbers are lower than those of a similar operation in 2013, during which 268 rats were killed on Tintamare, and 78 rats and 41 mice on Pinel. The reduction of food due to drought conditions is a probable cause for the reduced presence of these rodents on the two islands. At the same time, on Pinel, the restaurateurs have been better treating their garbage and discarded food and act on their side to regulate the population of rodents. Non-indigenous species, rats and mice love the eggs of birds and sea turtles. On Tintamare, the rats attack the gaïacs, as they like the seeds. This project, coordinated by the Réserve, was made possible thanks to the work of interns Nathan Leroy and Thierry Mordon- Constant. After a disappointing first experience, the Conservatoire du Littoral is once again trying to install dry toilets on Pinel. Thanks to successful experimentation by one of the island’s restaurateurs, who has had success with toilets that operate using a new technical system adapted to a tropical climate, the Conservatoire is going to install three such systems in collaboration with the Réserve Naturelle. The first will be installed shortly, and the other two in the spring of 2016. The treatment of gray water in Saint Martin is not properly handled in certain sectors, and the Établissement des Eaux et de l’Assainissement (EEASM), along with the Collectivité, has put the construction of new water treatment plants at the top of its list of priorities. Two such stations, one in French Quarter and the other at La Savane, are under construction. The Réserve remains vigilant, as these two stations are along the edge of salt ponds: the first at the Etang aux Poissons; the second at the Etang de La Savane, and both sites are protected by the Conservatoire du Littoral. An impact study was done, levels of acceptable discharge were set, and the compensatory measures accepted by the EEASM will be implemented : monitoring of the water quality in the ponds; integration of the water treatment stations into the landscape; replanting of vegetation around the sites; installation of facilities for the public, for example, a bird observatory. On the northern side of the island, where gray water currently runs into the Étang aux Poissons without being treated at all, the water treatment plant project for French Quarter —where gray water from Mont Vernon, Orient Bay and French Quarter will be treated— should be completed before the end of 2020, as it has access to European Funds to help with financing. The work will begin in 2015 in order to respect the timetable, and at completion will comprise underground installation of miles of pipes, including those in protected zones. Some legal procedures are necessary in terms of land use, and the Réserve Naturelle, like the Conservatoire du Littoral, are working to facilitate the process: a temporary agreement to rightfully use the land and the reduction of pollution that flows into the ponds steps in the right direction toward the protection of these fragile areas. At La Savane, as part of the construction of a new school complex and the treatment of its gray water, several pieces of land around the pond have been the site of illegal construction for many years, and the only solution to install the pipes for the future water treatment plant without destroying the homes would be to pass them by way of the pond. But how? The ingenious solution found by the EEASM and the Réserve will consist of installing a wooden walkway under which the pipes will be attached. This pretty walkway will have a double advantage, as it will also allow students from Grand Case to get to class without walking on the road. The Conservatoire du Littoral made a promise, and has kept it: the house that stood in ruins and was an eyesore on the magnificent site of Babit Point has been destroyed. The next step will consist of closing off the property with a wooden fence in order to protect it, and define the boundaries. The Conservatoire will participate in the next general meeting of the Oyster Pond trade association in order to consult and discuss with the residents of the neighborhood and get their opinion on future improvements intended for the site. Good news: the illegal occupation of government land in Saint Martin is negotiable, especially in comparison to the situation in Guadeloupe and in Martinique, where it must be noted, land belonging to the government is more abundant and widespread. That is the conclusion presented in the final report of a senatorial project intended to analyze the illegal occupation of government land in the French Caribbean territories. On a visit to our island on May 2, 2015, Guillaume Arnell, senator from Saint Martin, and Michel Magras, senator from Saint Barth, were part of the project delegation, along with two other senators and a Senate administrator. They appreciated the already existing collaboration between the Collectivité, the Conservatoire, and the Réserve, especially in terms of a shared vision for environmental protection. This collaboration will be tested shortly at the Baie de l’Embouchure, where the Conservatoire plans to invite the Collectivité to participate in the management of Galion Beach, as the planned improvements will primarily concern the Collectivité and its population. An intern at the Réserve from January 5 to June 15, 2015, Marine Nouhaud is a 22 year-old master’s degree student in “Ecology and Dynamics Of Coastlines and Estuaries” at the University of La Rochelle. 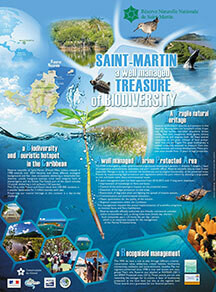 Her task was to update the atlas illustrating the sites in Saint Martin where sea turtles lay their eggs. Created six years ago by Pauline Malterre, who was at the time the scientific director at the Réserve, and Éric Delcroix, director of sea turtle coordination in Guadeloupe, this atlas synthesizes the current condition of all the beaches frequented by these turtles during their egg-laying period, on the entire French side of the island. On the beaches included in this atlas, Nouhaud has noted all of the changes that have taken place since 2009, primarily concerning the state of the vegetation development on the beaches. She will make recommendations necessary to improve conditions for the turtles. For example, planting sea grapes along the edge of the beaches, as the Réserve has already done on Pinel and at Grandes Cayes. At the same time, she is participating in the monitoring of sea turtles with a team of 60 eco-volunteers who are charged with surveying the beaches twice per week in order to record traces of turtles that have dug their nests in the sand. The 17 mooring buoys placed at the disposition of boaters in front of the Bay Blanche Beach in Tintamare were all revised and replaced if necessary. These buoys are connected to their mooring blocks by a cord made of steel and nylon that should resist damage by propeller blades as well as attempted theft. At the same time, all of the moorings and buoys installed at various dive sites were also verified, repaired, and eventually replaced if need be. In late April, the cross of Saint-André and the light atop the large yellow buoy marking the boundary of the Réserve Naturelle near Rocher Créole have disappeared, most likely during a collision with a boat. The Réserve invites anyone with information about these items to contact Franck Roncuzzi at 06 90 57 95 55, without risk of punishment. To repair the buoy costs 1,200 euros and the Réserve would be relieved to recover the cross and the light, even if they are damaged. 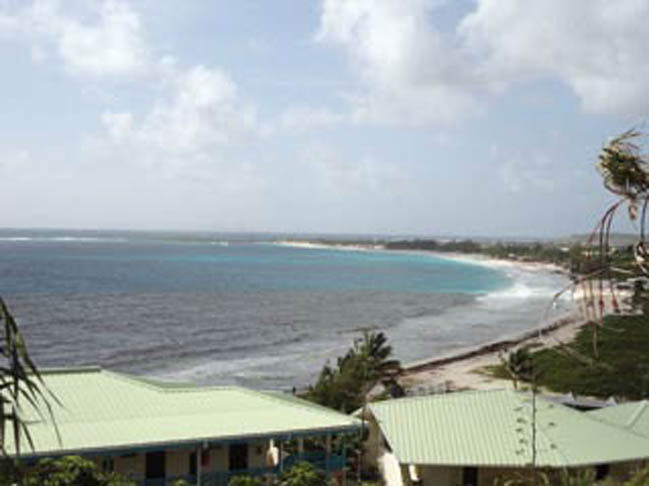 Every year, Saint Martin hosts Fish Day, which is held the first Sunday in May at the embarcadero on Pinel island. The Réserve Naturelle facilitates the flow of numerous visitors by allowing vehicles to use the shortcut between the Etang de la Barrière and the Grandes Cayes road. This authorization is coordinated with the Collectivité, so that the impact on this natural milieu is as imperceptible as possible. In preparation, the Réserve has repaired the path in the mangrove that was damaged by hurricane Gonzalo and cleaned up the pond. As for the Collectivité, it organized the removal of a part of sargassum seaweed that had been piling up for several months. A foreseeable consequence of badly controlled construction is the overflowing of the ponds in Terre Basses following the strong rains on November 8, which caused severe flooding. It took several days for the situation to return to normal, as the water eventually flowed toward the sea. As owner of these ponds, the Conservatoire du Littoral should be consulted if the Homeowners Association of Terres Basses decides to do work to handle the evacuation of rainwater. In January 2015, the Conservatoire du Littoral will confirm its land-use strategy for the year. As there is a new urban planning map (PLU) for Saint Martin, the Conservatoire is particularly vigilant about the future of certain sites: Bell Point between Grand-Case and Anse Marcel, Red Rock along the Sentier des Froussards, and the hillsides around Pic Paradis. After the acquisition of three pieces of land in 2013 at Babit Point, the Conservatoire completed amiable negotiations with the Association Syndicale Libre of Oyster Pond (ASLOP) in October 2014 to acquire the three remaining pieces of land that now make the Conservatoire the sole owner of the site. This acquisition serves as a guarantee for the residents of Oyster Pond that this beautiful landscape will remain natural and undeveloped. As part of the rejuvenation of the site, the ruins of a house that are an eyesore will be subject to a removal of asbestos in early 2015, before the structure is demolished. In coordination with the local residents, the next step will be the creation of a botanic trail open to the public, with an observation point, as well as an overall replanting of the vegetation at Babit Point. The Halophilia stipulacea marine plant are gaining ground: this invasive species has an important presence in the Simpson Bay lagoon, where it was introduced into the environment by boat anchors. It is currently increasing around Long Bay, where a long, thick band was observed by Julien Chalifour, not only on sandy land where there is no other vegetation, but also mixed in with the existing sea grass, which is more alarming. This evolution should be monitored, and the Réserve encourages everyone to please report any observations of this algae (location, depth, mono-specific or not) and to provide photographic documentation. Gonzalo not only caused a lot of damage on the water, but also under the water as well. At a depth of 20 meters, the hurricane managed to displace the modules of cinder block that create the Bio- Hab artificial reef. A team from the Réserve did a dive once the water was clear enough to see how many of the modules had been disturbed or actually moved. This gave them an idea of the violent nature of the water during the storm and how it had such an impact at that depth. The damage was limited in that none of the blocks were actually broken and the Réserve crew is already reconstructing that which they so carefully put in place last year. 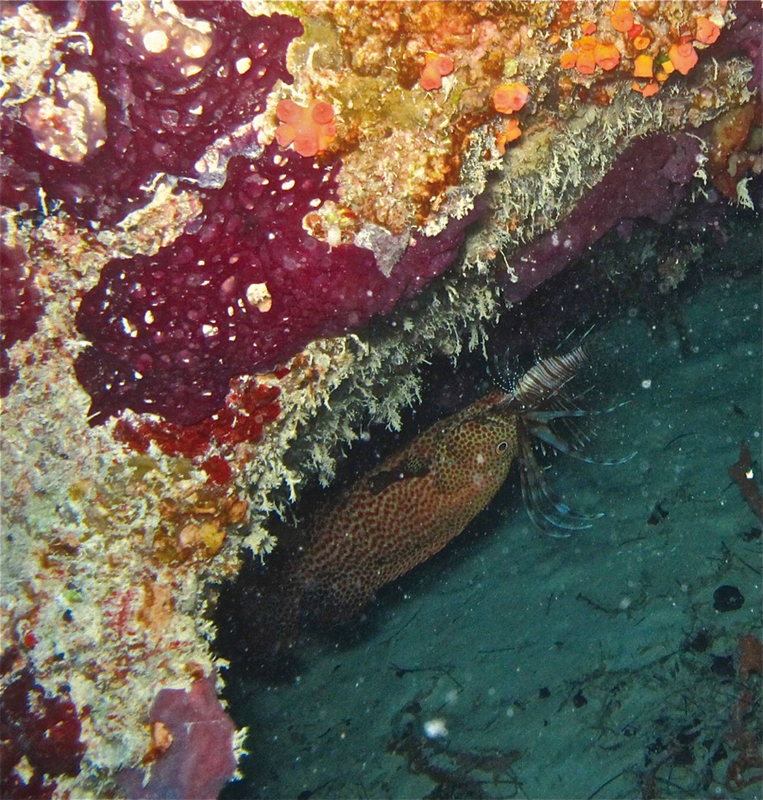 Curiously, some new species have appeared about the BioHab, such as a species from the Haemulon family and a lionfish, that had previously not been seen at this site. On the other hand, some other species are no longer there, such as adult lobsters, which may have moved to other sites with the strong currents. This unexpected damage will slow down the Bio- Hab2 project, planned at a depth of 15 meters. One note of good news: the coral reefs do not seem to be impacted by Gonzalo.. 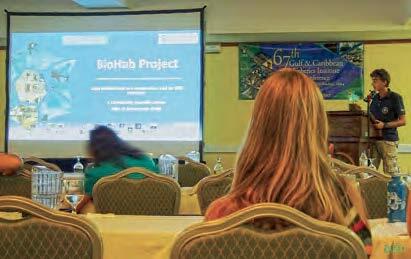 The details about the colonization around the BioHab in Saint Martin is no longer a secret for the 200 specialists of marine resource management who came from the Gulf of Mexico and the entire Caribbean basin to attend the 67th annual meeting of the Gulf and Caribbean Fisheries Institute, held this year in Barbados. Julien Chalifour, head of the scientific division of the Réserve, presented the BioHab project, which was of great interest to the attendees. His trip was made possible thanks to funds from the United Nations Environment Program (UNEP) and the Regional Activity Center For Protected Spaces and Species in the Caribbean (CAR-SPAW). Turtle brigade of the Réserve presents its annual report. More than 653 patrols were reported on at least 10 beaches on the island, with 249 traces of sea turtles returning to the place they were born to lay their eggs. Yet this number is a little deceiving. 2014 was considered as “a year of the turtle” as the reproductive cycle for sea turtles hits a peak every two years. In 2012, 185 traces of egg laying were noted by 529 patrols, or almost as many traces yet many fewer patrols. In comparison, there were 277 traces for 1,018 in 2013. Once again, this trend does not necessarily translate to the number of adult turtles present in the sea as they do not lay eggs every year, but rather every two or three years. A special thanks to the increasing number of eco-volunteers who respond to the requests of the Réserve. Between March and November 2014, the Réserve Naturelle reported five sea turtles that had washed ashore on the island’s beaches. Two of these turtles had died due to collisions, one near Anse Marcel and the other near Orient Bay; two were killed by poachers in Grand-Case, and the fifth one, which measured 27 inches in length, was found on the beach in Orient Bay, apparently the victim of a natural death. In accord with the Conservatoire du Littoral and after an unfruitful attempt tentative at conciliation, the Réserve Naturelle decided to enforce a stricter strategy to ensure that commercial operations at Galion respect the regulations. As a result of controls by the agents of the Réserve last November, three out of four companies - The Butterfly Farm, the GM Education dog training center, and the PawSitive refuge - were not respecting the law and cited for two different infractions: first for occupying land that belongs to the Conservatoire du Littoral without authorization; and secondly for non-authorized activities within the Réserve Naturelle. Only the Bay Side Equestrian Center, which follows the law to the letter and was included in the creation of the Réserve, can provide this type of activity. On Monday, November 24, the Réserve Naturelle filed a third report against the hotel, La Samanna, for runoff of gray water into the Grand Étang at Terres Basses, and this came after two requests that the hotel do the necessary work to avoid the pollution. In 2012, a meeting was held with the Réserve, the management of the hotel, and the “Establishment For Water And Sanitation” (EEASM), owner of the pipes and the pumping station that La Samanna claims were not functioning properly. Yet is seems that some of the gray water coming from the laundry of the hotel has not been properly filtered and the residue from textiles causes clogging, while at the same time, the grease traps are too small, and all of the gray water from the hotel is released into the system without any sort of treatment. The report was sent to the assistant prosecutor and the case will be judged in Saint Martin. The official regulation prohibiting kite-surfing in Galion bay is sadly not always respected—and often misunderstood - but the agents of the Réserve Naturelle are willing to discuss this with those who like this sport, and until November 21 had not been obliged to fine for infractions. But on that day, a kite surfer who had been warned several times was eventually fined for the practice of an activity that is not allowed within the Réserve. 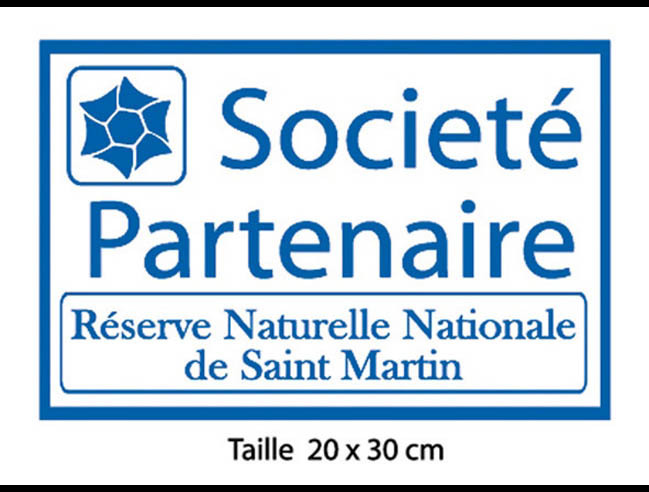 The ONCFS (French National Office For Hunting and Wildlife) does not have a branch in Saint Martin, but regularly sends agents from Guadeloupe on assignment. 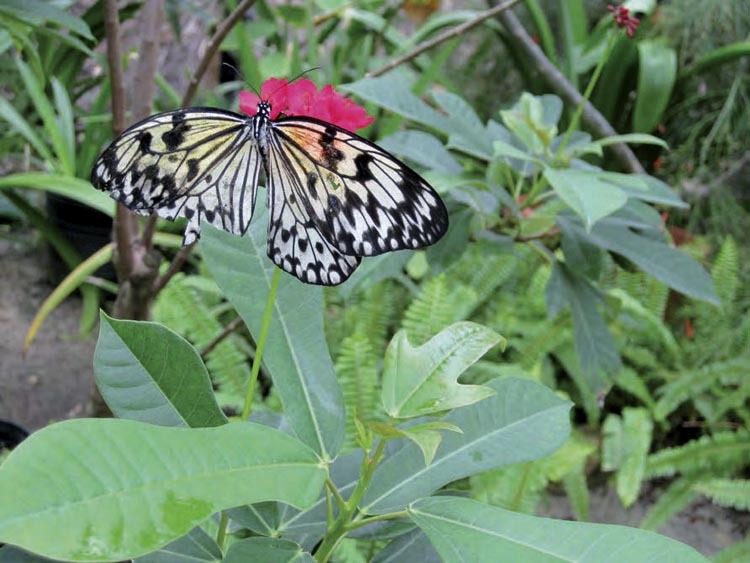 Present on the island from November 17-21, two ONCFS agents controlled The Butterfly Farm and noted that the operator was working without authorization from the Réserve or the Prefecture, in spite of numerous reminders that he had neither the insurance or authorization to possess wildlife. A violation was issued and sent to the pubic prosecutor’s office. Introduced by Japan and then taken on by the rest of the world, notably the island of Reunion, the main purpose of artificial reefs is to increase the biomass by favoring the survival of fish and crustacean species. In Saint-Martin, where coral cover is scarce, this project opens new horizons, especially for fishermen and divers. Note: up until now, no lionfish have been observed on the site. Éva Moisan arrived at the Reserve in February and had six months to study the Halophilia stipulacea, an invasive species introduced through boat anchors that is slowly taking up more and more space on the seagrass beds. The evening before her departure, this professional Masters student from the University of Corte delivered her final report and gave nuanced answers about the consequences of the arrival of these algae in the waters of Saint-Martin. Firstly, this plant is smaller in Saint-Martin than it is in the rest of the Caribbean. Here, its rhizomes grow from 0,26 to 2,16cm per day, whereas a daily growth of up to 6cm was recorded on other Caribbean islands. Her study showed that the algae has a stunted growth on the sites where it is competing with Syringodium and Thalassia, both local species, but that it is rapidly spreading across deeper sand plains that are uninhabited by vegetation. As a measure of precaution, the first observations are pointing towards classifying this plant as a potentially invasive species – taking into account that it continues to spread, it is not regressing on any of the sites where it is already colonized, and after a year, it has appeared on five new sites. It has already been given the status of an invasive species by other islands in the Caribbean. On the other hand, the progress made during this study doesn’t permit an affirmation that this species is necessarily destructive. New studies should be able to clarify conclusions, particularly those concerning Halophilia stipulacea’s interaction with local flora. 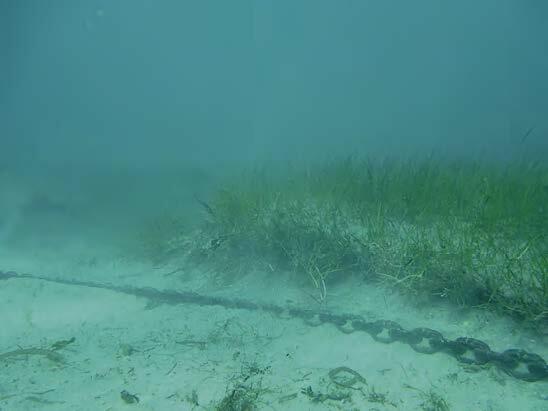 Note: the plant takes advantage by establishing itself where the native seagrass is most fragile, usually as a result of certain sites having had waste water poured into them, or being victim to destruction by way of boat anchors and their chains. 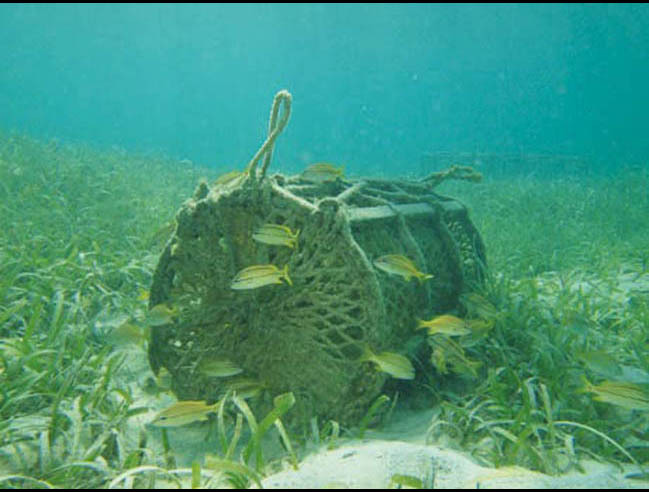 In order to avoid the destruction of seagrass beds, boats now have to use the mooring buoys that the Nature Reserve has installed at Créole Rock, Pinel and Tintamarre. Thanks to the work done by Léa Daures, a twenty year old student at the Faculty of Science in Montpellier, the atlas showing all the sites where sea turtles nest is now up to date. Five years ago Pauline Malterre, who at the time was officer-in-charge of the scientific department at the reserve, created this atlas together with Eric Delcroix, who was the manager of the sea turtle network in Guadeloupe. This atlas recapitulates the current state of all the beaches that the turtles return to during nesting season. During her voluntary post-license internship, Léa walked all the concerned beaches in order to record any changes that had taken place in 2014. Basing her report on the existing data, she noted any apparent changes to the beach surfaces; an increase or decrease in vegetation, new buildings, and any other factors that could disturb the turtles when laying their eggs; bright lights or noise, for example. This atlas covers all nesting zones for sea turtles throughout the entire French Antilles, and its regular updating is an additional tool that helps towards their preservation. On June 6th, a dishonest man was caught in the act of stealing sand from Grand Cayes beach. The quantity of sand stolen was only 3 bucketfuls; the Reserve guards let him off with a warning. As part of the agreement signed with the prosecutor and children’s judge, the Reserve hosted two persons guilty of minor offenses that had admitted to their crimes, and agreed to perform TNR (travail non rémunéré - unpaid work) for the benefit of the community. This program is different from TIG (travail d’intérêt général – community service), in that the offenders avoid going to court and entering into procedures that are sometimes unsuitable with regards to the gravity of their acts. Their work consisted of cleaning up Grandes Cayes beach, for one day in June for the first offender, and in August for the second. Water sanitation is a necessity and as we know Saint Martin still has a long way to go in this domain. The Etablissement des Eaux et L’Assainissement de Saint-Martin (EEASM) is responsible for this area, and acts together with the Collectivité on related projects, notably the implementation of the Sanitation Master Plan, through construction of water treatment plants. Well aware of these realities, and the fact that the protected areas that they are responsible for should not suffer in any way from the development of such equipment, the Nature Reserve, Manager of the Conservatoire du littoral sites, is consulted by the EEASM before the launching of any of their projects. A first water treatment plant was built by the EEASM for the sector of Oyster Pond, and went into operation in March 2013. After a 6 month observation period, the waste from the plant is being emptied into the Baie Lucas pond; the pretty salt pond located on the bend, on the right-hand side of the road between Coralita and the entrance of Oyster Pond. The Manager monitors the project since its conception and the expulsion of waste into the salt pond was only authorized once an impact study had been carried out. The Water Act ensures and imposes different measures to be certain that there is minimum impact on the environment. The Nature Reserve has included this site in their monthly monitoring of birds in the salt ponds. Furthermore, the EEASM must ensure that the practices used are the most qualitative possible. A scientific study of the waste and the salt pond will be carried out every six months, in order to monitor the quality of the water. The partnership, made up of the Nature Reserve, the Conservatoire du Littoral and the EEASM, was formed with the objective of conserving the condition of this salt pond. Vigilance needs to be maintained for the years to come. 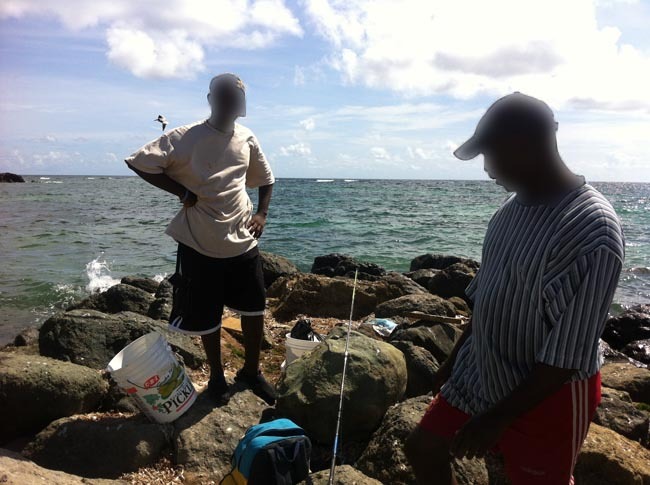 On February 10th whilst two guards from the Reserve were patrolling along Galion Beach, Baie de l’Embouchure, they surprised and challenged an individual in the act of fishing with a net. The man, a recidivist, reacted aggressively towards the guards who then charged him. He was tried by the criminal court in March and sentenced to a fine of 850 euros for threatening and insulting the guards from the Nature Reserve. The Baie Lucas pond and the salt pond at the cemetery in Grand-Case, have also been equipped with bird observatories, much to the delight of visitors, who now have three observatories on the island. The aim is to improve awareness of the natural heritage of these wetlands, and also to promote local development of bird watching, which, thanks to the 14 protected salt ponds, has real potential for ecotourism. Two minutes away from the whale observatory in Coralita and not far from the Babit Point site, Oyster Pond is strengthening its ecotourism vocation with a new bird observatory, put up by the Nature Reserve and the Conservatoire du Littoral and in partnership with the EEASM (read the previous article). Built on the edge of the Baie Lucas pond, the lookout is accessible by way of a small wooden path, and allows visitors to discover the wader bird in their natural environment, but that’s not all… If you are a little bit patient, you’ll witness the amazing fishing skills of the kingfishers that frequent this site. Information signs are going to be put up soon telling us all about the bird species present, and also facts about the botany, landscape and geology of the site, where mangroves grow adjacent to cacti that grow in the middle of large rounded rock masses. Every year from March to May, the salt pond beside the cemetery in Grand-Case transforms into a heronry. 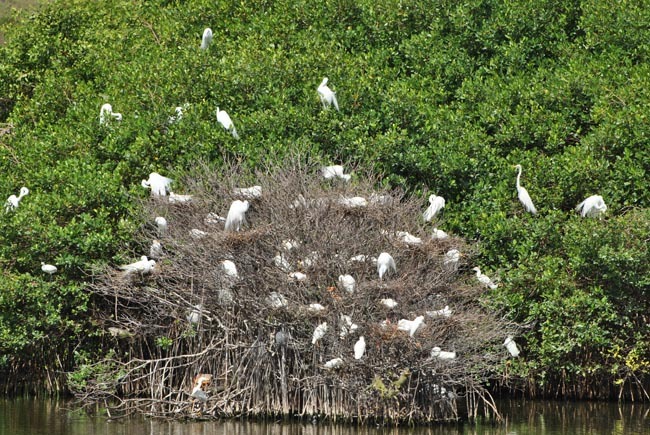 Great egrets, snowy egrets and cattle egrets nest by the dozens in the thicket of the red mangrove that becomes a nursery. These large birds, with their chicks, dot the landscape with their white feathers, putting on an exceptional show that can now be peacefully admired from the wooden observatory that will very soon been equipped with information signs. The Nature Reserve and the Conservatoire du Littoral, under the agreement of working together on projects concerning them both, organized the development of this remarkable site. The next step will be to develop the area around the site. Reintroducing the Lesser Antillean Iguana ? The Lesser Antillean Iguana (Iguana Delicatissima) is an endangered species. Virtually wiped out in Saint-Martin, certain descendants may however possess genes from both species. The Common Iguana (iguana iguana) that was introduced has the ability to hybridize with our local species. In order to reintroduce Iguana Delicatissima into its natural environment, the Ministry of Ecology, via the National Office for Hunting and Wildlife (ONCFS), has launched a national plan of action. Chloé Rodrigues, veterinarian, is in charge, in collaboration with Julien Chalifour, of coordinating this plan in Martinique, Guadeloupe and in Saint Martin, where she stayed for a week in mid-April. The species still exists in Sint Eustatius, Anguilla, La Désirade, Petite Terre, Saint Barthelemy and in Dominica, and the idea - noted in the Nature Reserve’s Management Plan - is to study the feasibility of a conservation strategy to be set up on one or several isolated islands with a few individuals. But where? The Common Iguana is very present on Tintamare and the Lesser Antillean Iguana is far too good a swimmer to remain confined on an island too close to the coast, such as Petite Clé for example. Adrien Tonon, a Masters 1 student at the University of La Rochelle, is being hosted by the Reserve from April 14th until June 6th. During these two months, he is working on constructing an artificial underwater habitat, a pilot project destined to become a choice habitat for thousands of larvae, which will ensure their survival. The student has already started writing up a summary of all the principal works published on the subject of how these artificial reefs work and that exist the world over. These reefs have different functions. The can serve as dive sites, support the production of biodiversity through larval survival (as in Saint Martin), protect a coastline or even encourage fish to gather to help fishing. Adrien will then focus on building the reef, made up of air blocks, and whose implementation has already started within the reserve’s territory. The establishment of this first experimental reef will be followed by a second reef. 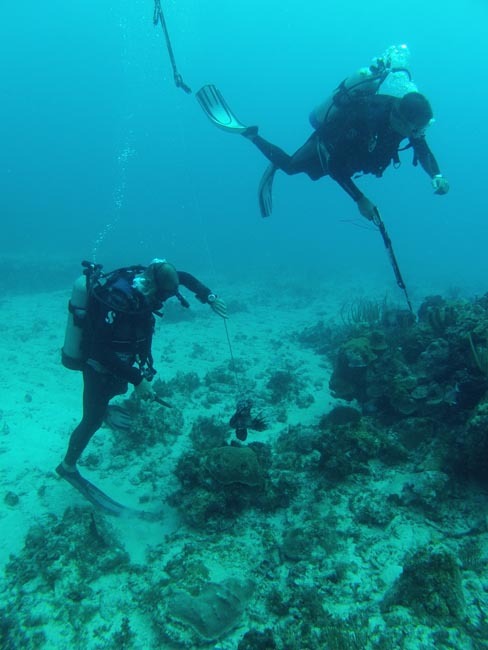 The second reef will be accessible to divers, allowing the Reserve to measure the impact of human activity on these artificial, but very alive, habitats. In 2013, the guards caught 57 lion fish in the Nature Reserve waters, cut them in half and left them where they were discovered. The aim was to get other fish to start enjoying the taste of their flesh, and eventually become their predators. The tests to determine if their flesh is contaminated by ciguatera toxins continue, the initial results have shown that certain fish were infected, and others weren’t, depending on their origin. The guards, as well as two professional fishermen, continue to collect specimens at different depths and sites. 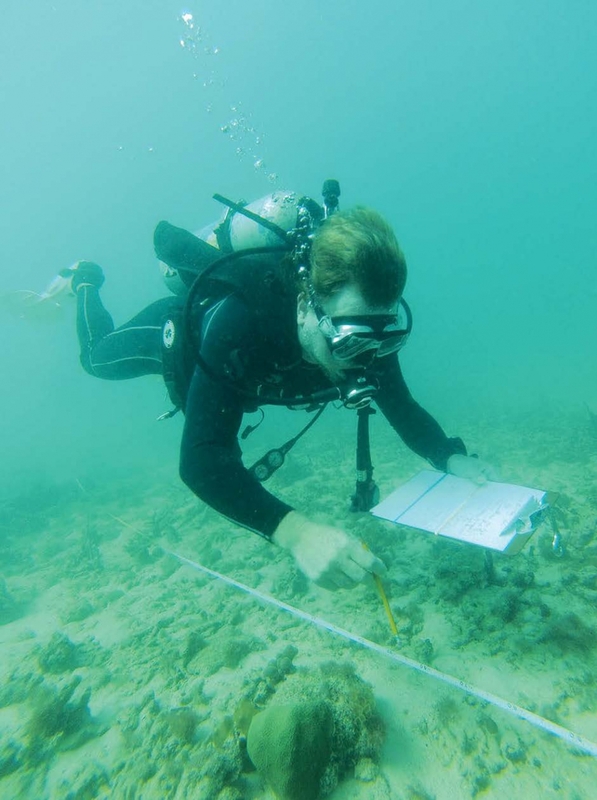 These specimens will be studied by the Institut Pasteur, which will then allow us to determine precisely at which sites the lion fish are edible and at which sites they are not. On August 25th, the Green Turtle, Gaïa, that had been shot with a spear gun, the arrow entering at lung level, was lucky enough to cross paths with Julien Chalifour, Head of the Scientific Division at the Reserve, who was out on the water that day, just off Orient Bay. Veterinarian Claire Saladin examined Gaïa and realized she was in immediate need of being operated on to remove the arrow. 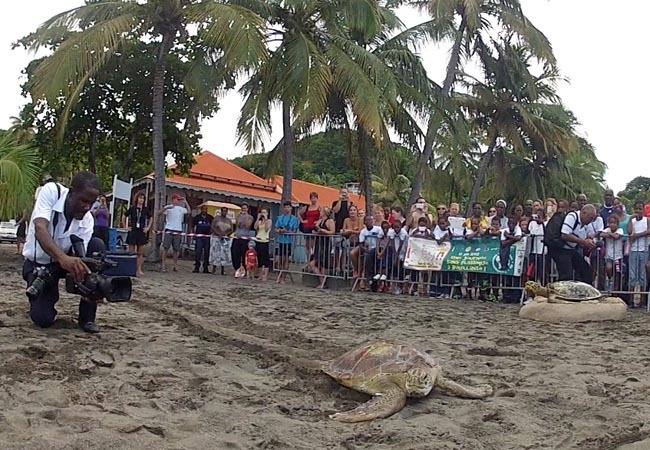 Due to the lack of equipment in Saint- Martin, the turtle was evacuated by plane to Guadeloupe where the ONCFS took charge of her at the marine turtle health center. Operated on by Dr. Leveque, Gaïa was kept in a recovery pool for two weeks before being released back into her natural environment from Malendure Beach in Guadeloupe, on September 18th. 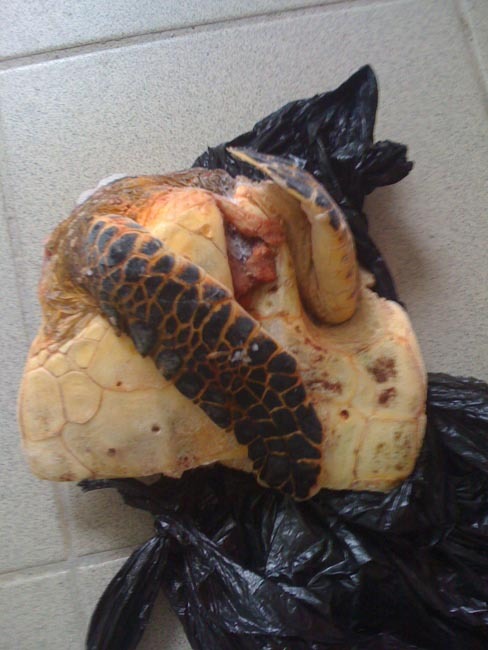 The destruction of marine turtles is a crime severely punished. But poachers continue none-the-less, as Gaïa’s wounds would attest, as would the turtle plastron (under shell) found by the Reserve outside the Reserve boundaries, and the turtle remains discovered by the gendarmerie in a private residence on October 18th (see the section below : “Police actions”). Thanks to the 58 eco-volunteers, 831 patrols were able to be conducted on 13 of the island’s beaches, and 277 tracks of turtles crawling up the beach were registered. 71% of these tracks led to a nest, representing 197 clutches. The first steps have been taken towards the destruction of the ruins of a house on Babit Point and the old hotel in Galion; an asbestos survey was launched in November by the Conservatoire du Littoral. This preliminary diagnosis is obligatory before demolition of any building constructed before 1997. And if there is any asbestos present, a site cleanup will be obligatory so that this dangerous contaminant cannot spread through the air and the waste that is removed can be placed in an approved site. The Babit Point ruin dates from the 60s and is built on a plot of land that the Conservatoire acquired in April 2013. As soon as the results of the samples, currently being analyzed in a laboratory, are through, the Conservatoire will launch a tender for the demolition of this house that is ruining the landscape. Following the demolition, long-awaited by the residents, a restoration program of the landscape and minerals will be implemented. Concerning the ruins at Galion, dating from the 80s, the Conservatoire unfortunately has to await the outcome of the expropriation proceedings that are pending, before going forward with the destruction. These ruins are located on the edge of one of the most popular beaches on the island, on a site that not only natural but also very ecologically rich. When a site that belongs to the Conservatoire du Littoral is open to the public, consideration needs to be taken to address the visitors’ toiletry needs, and thereby the installation of ecological toilets. 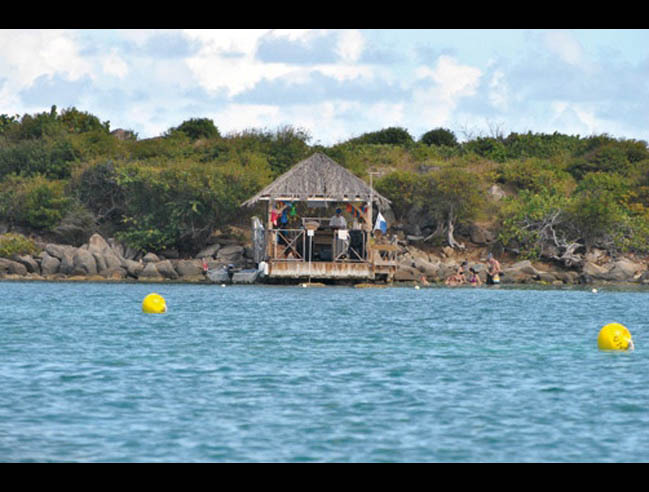 The decision was taken to install two dry toilets on the island of Pinel, financed with the help of Europe and the State, and considered a good ecological solution in an isolated area that is not linked up to the public sewage network. Their maintenance was entrusted to the two restaurant owners who hold temporary occupation permits. These permits were issued by the Conservatoire, in the context of good environmental practices that they are committed to respect. Today, the toilets are still in the experimental phase, and are not entirely satisfactory with regards to their capacity in full tourist season, and the old, more “classic” toilets, are still being used. There are on average 500 visitors going to Pinel every day, and if the capacity of these facilities proves to be insufficient, the Reserve is well aware that they will need to find another solution. As soon as the house ruins have been removed from the site, it is planned to build a nature trail with information signs along it. They will highlight the value of the Melocactus and other floral species, as well as the landscape aspects of the site; its rocky chaos and opening towards the Atlantic Ocean and the island of Saint Barthelemy. Après la dépolluAfter cleaning up the site of a former sand quarry at the mouth of the Etang aux Poissons, the Conservatoire hopes to achieve an ambitious project of ecological restoration and public reception on the site. This project has, up until now, been delayed, due to a lack of co-financing. The Conservatoire hopes that in 2014 with the help of the State and Europe, it will be able to start this work. The Etang du Cimetière in Grand-Case is an important nesting location for egrets, and is going to be equipped with a bird watching hide that will allow the public to observe these beautiful birds in full discretion. The Neighbourhood Council No. 3 approached the Conservatoire about building a fitness trail around the Etang Guichard, just near to Friar’s Bay Beach, and the Conservatoire is ready to finance the work. However, as it owns the water but not the banks, the Conservatoire will need the authorization of the owners for the right of way. 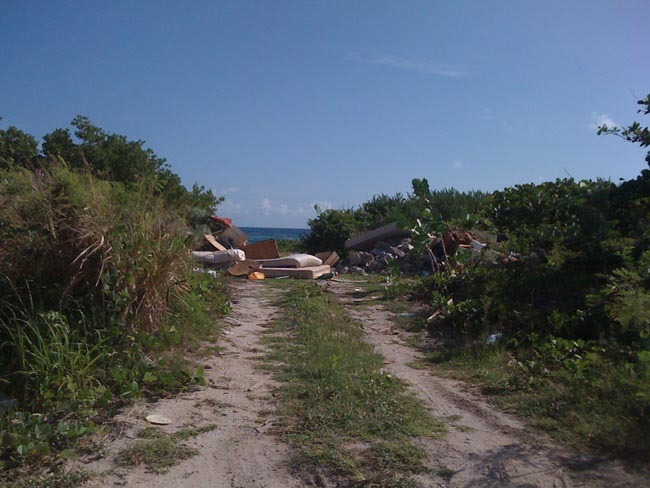 As the beach of Grandes Cayes is located alongside the road leading to the ecosite for waste treatment, it is unfortunately often used as a dumping ground. The public using this site also tend to park as close to the beach as possible, which prevents natural backshore vegetation from growing. In order to curb these intrusive actions, the Conservatoire intends to begin vegetal restoration of the site, and to place several blocks in key positions to limit vehicle access and stop the far too frequent dumping (for which another perpetrator was fined by the Nature Reserve in December). During scientific monitoring of birds around the salt ponds , the team came across a large amount of munitions of all kinds thrown into the shallows of the Etang Rouge. 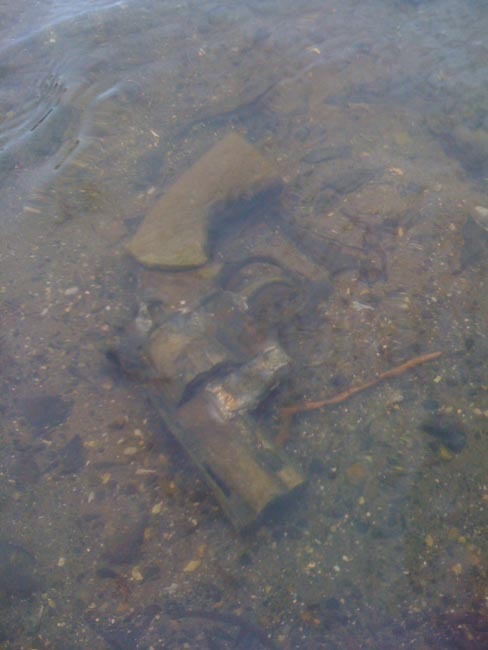 A few weeks later, on October 31st, the Reserve guards discovered a 357 Magnum pistol and an anti-personnel mine detonator, still in working condition, also in the Etang Rouge. These weapons were recovered with the assistance of the Investigation Brigade from the gendarmerie and a destruction certificate was signed. Following an article published in the Faxinfo stating that a 25kg snook was caught in the Etang aux Poissons, the guards found the fisherman and an official statement was drawn up against him. Whilst the Radisson «Beach Clean Up» was in full swing, the guards spotted two underwater hunters. After being summoned, the two men showed up at the Reserve offices. Their fish and fishing equipment were confiscated. Thanks to a witness phoning in, the guards apprehended two anglers on the Coralita beach. Their fish and fishing rods were confiscated. 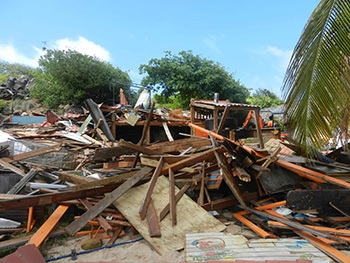 The beach restaurant on Pinel island, “The Key”, has been demolished. This long-awaited demolition is the culmination of several years of litigation. A recap: this restaurant, that was already illegal, built on further extensions by way of a first floor in 2008, without any permission. The establishment refused to comply, unlike its neighbors, and ignored the environmental requirements and the payment of a fee to the Nature Reserve that goes towards the management of the sites. After several attempts to find an amicable solution, the Conservatoire filed a judicial procedure against the establishment’s managing company, in July 2010, for illegal occupation and construction in the public domain. Following this procedure, on March 22nd, 2012, the Administrative Court of Saint-Martin sentenced the managing company to demolish this building. The conviction was upheld at the appeal on November 29th, 2012. As the managing company did not carry out the demolition within the deadline stipulated, the Conservatoire du Littoral was authorized, by two court sentences, to demolish it. And now, as the removal of building material comes to an end, it is time to move on to the retrieval project of this natural space that is going to increase the size of the public beach on Pinel and allow a wider audience to enjoy this beautiful area free of charge. The Reserve plans to plant sea grape trees, and build a shaded picnic area. espaces protégés Le Journal de la Réserve Naturelle Nationale de Saint-Martin N°18 Juillet 2013 Managing The Impact Of Human Activities In Protected Areas Saint-Martin had the honor of hosting the annual meeting of the Conseil des Rivages Français d’Amérique (CRFA), from April 4th to 6th, 2013. The plenary session was held at the Beach Plaza Hotel and more than 70 attendees were present. Elected officials from Guyana, Martinique, Guadeloupe, Saint-Barthelemy, Saint Pierre and Miquelon, and Saint-Martin, met to validate the projects of the Conservatoire du Littoral, and in particular the new perimeters of land intervention. Viviane Le Dissez, President of the Conservatoire du Littoral, Michel Peltier, Deputy Director, Garcin Malsa, President of the CRFA, Marc Duncombe, Overseas Territorial Delegate for the Conservatoire, the Préfet, Philippe Chopin, and Guillaume Arnell, Vice-President of the Collectivity’s Sustainable Development Pôle, each took their turn leading the session. 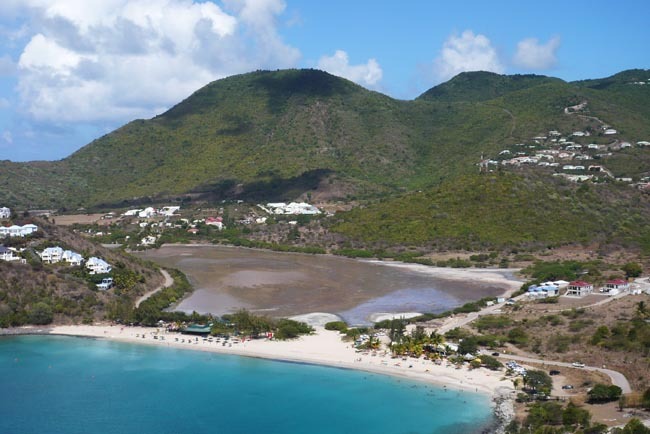 For Saint-Martin, the elected CRFA officials - those being Guillaume Arnell, and Territorial Councilor, Christophe Hénocq - approved the proposed project of expanding the Conservatoire’s perimeters of protection in the area of the Barriére Salt Pond. The Conservatoire wishes to extend its protection to the mangrove areas located north of the pond that are currently unprotected. This validation given at the Conseil des Rivages authorizes the Conservatoire to approach the landowners concerned (in this case, the Collectivity of Saint-Martin, who was approached in May by the Conservatoire regarding this issue). Again with regards to this site, the Conservatoire wishes to work in collaboration with the Collectivity on the development of the boundary area between the pond and the sea, and more widely to the dock area of Cul-de-Sac, with the idea of welcoming the numerous visitors for Pinel in a more appreciable environment. 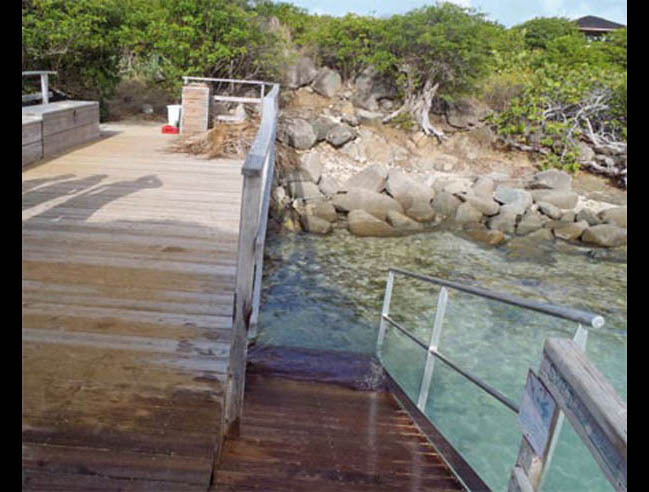 Further to this, the inaugural visit of the stilted wooden walkway on the Barriére Salt Pond, recently built by the Conservatoire du Littoral, took place during the CRFA. This trail allows visitors to enter the heart of the mangroves that are home to many bird species. Thanks to the numerous educational signboards posted along the walkway, the secrets of the mangroves no longer remain hidden from visitors. 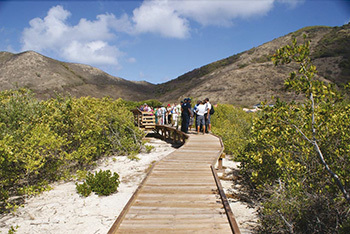 This walkway completes the network of facilities already established by the Conservatoire du Littoral, whereby all the major types of ecosystems on the island are now represented: dry coastal forest on the trail of Froussards, coastline vegetation on Pinel, and seascapes at the Coralita Observatory. We’ll know very soon if lionfish carry Ciguatera toxin or not. A meeting with fishermen, marine professionals and managers of marine protected areas is already scheduled for July 2013 so that scientific advisors can present their conclusions, and the correct information can then be communicated to the different areas concerned. The spread of this invasive species, this voracious fish without predator, poses a major risk that threatens to decrease fish stocks in the future, as confirmed by the Regional Committee of Maritime Fisheries and Marine Fish Farming (CRPMEM) of Guadeloupe, who met with commercial fishermen, sailors, the Collectivity and the Prefecture on May 15th, 2013. Saha Widgy, Head of scientific missions at the CRPMEM, informed the fishermen on the history of the invasiveness of this fish proved through various releases into the wild by aquarists of Florida, as well as the biology of the species and the risks it poses, namely a very painful sting and the possible transmission of Ciguatera, to which Chlordecone contamination can be added in Guadeloupe and Martinique. The CRPMEM gave fishermen an information sheet on what to do in the presence of lionfish, and a pair of protective gloves against the sting of its fins. In order to educate the entire public and fight against this invasion, the Nature Reserve plans to hold a fishing tournament before the end of the year. les gardes de la Réserve naturelle ont dressé un procès-verbal au titre de la loi sur l’eau à un hôtel pour une pollution et un déversement d’eaux usées dans le Grand étang des Terres Basses. Cette pollution est due à un dysfonctionnement du réseau d’assainissement de l’hôtel, resté sans solution depuis plusieurs années. À l’Est de l’îlet Pinel, le 9 mars, deux pêcheurs armés de fusils harpons ont dû remettre leur équipement aux gardes de la Réserve, la pêche étant interdite sur cet espace protégé, comme d’ailleurs sur tout le territoire de la Réserve. Le 20 mars, à Pinel, les gardes ont ordonné l’arrêt de la construction d’une station d’épuration privée. Ces travaux avaient lieu sans autorisation, sur le territoire du Conservatoire du littoral. Un filet de 100 mètres signalé par un témoin a été retiré et saisi par les gardes dans la baie de l’Embouchure, en plein coeur de la Réserve naturelle, le 15 juin. Trois jours plus tard, les mêmes gardes ont constaté la présence de deux casiers pleins de poissons entre Petite Clé et la côte, à Cul-de-Sac. Les casiers ont été saisis et les poissons remis en liberté. Tommy Vallon, an intern at the Nature Reserve, has the mission of managing the problem of rodents that were introduced onto Tintamare. Fond of eggs, whether it’s birds eggs or turtles eggs, these mammals threaten the reproduction of the Brown Noddy, the Tropicbirds and sea turtles - all of which are heritage species. This problem originates from a rat species and mouse species and our intern is going to initially trap these rodents, without killing them, in order to identify them. This first step will likely be followed by the control of these species, following a well-defined strategy. 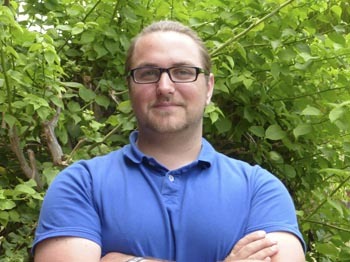 24 Year old, Tommy Vallon is a student at the University of Antilles-Guyane and is undertaking his end of studies internship in Saint-Martin as part of his Professional Masters in Tropical Ecology. The left-overs from picnics are a source of food for these rodents. Make sure that you take all your waste home with you! 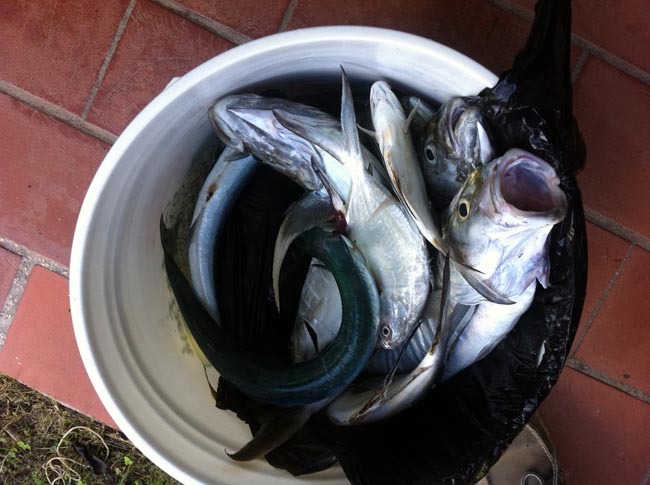 A weighing scale and twenty pounds of fish were seized by the Nature Reserve’s field rangers, in the parking lot of the whale observatory in Coralita, on November 23rd, 2012. That day, two rangers on patrol noticed four individuals who had just come out of the water and were equipped with spear guns and carrying bags. Upon verification, two of these novice fishermen were already known to the Reserve and had already been brought before the criminal court following the booking for illegal fishing in the Nature Reserve. About twenty pounds of fish had already been weighed and was packaged in plastic bags, ready for sale. Four official statements were taken down and four fishermen will as a result appear before the criminal court. Tintamarre: setting the table ! The eyes of the Réserve Naturelle are turned toward the island of Tintamare, where three new wooden tables have been installed. This makes a total of six tables that were all fabricated by the carpentry and woodworking students at the polyvalent high school for the Northern Islands. The tables await those who want to picnic in the shade of the filao trees along the beach, just a few steps from the crystal clear water. As requested, the agents of the Réserve installed the tables close to each other, in order to accommodate groups of up to 20 people. In order to limit the risk of a fire, two special spots have been allocated for cooking, which is otherwise prohibited. These spots are equipped with grills that are for the use of visitors. And as Tintamare does not just comprise the beach in Baie Blanche, the staff of the Réserve also cleaned up an area around the reefs, where they found four 200-liter containers dumped into the sea, a large fishing net and a large bale of plastic wire. If you fish in the Réserve, you might have to clean the beach! Caught while fishing in the Réserve Naturelle in the company of his father, an adolescent aged 14 - thus legally responsible - was ordered to do five half days of community service... in the Réserve. In this case, the judicial protection service for minors signed an agreement with the Réserve Naturelle, which could eventually help other young people in similar legal situations. In late August, the adolescent in question cleaned the beaches of Tintamare, Grandes Cayes, Galion, and Pinel, in the company of a ranger. In addition, his final half day was spent on the Réserve’s boat for a session dedicated to environmental education, during which time a park ranger instructed him about the protection or marine flora and fauna, and the importance of respecting the rules and regulations. 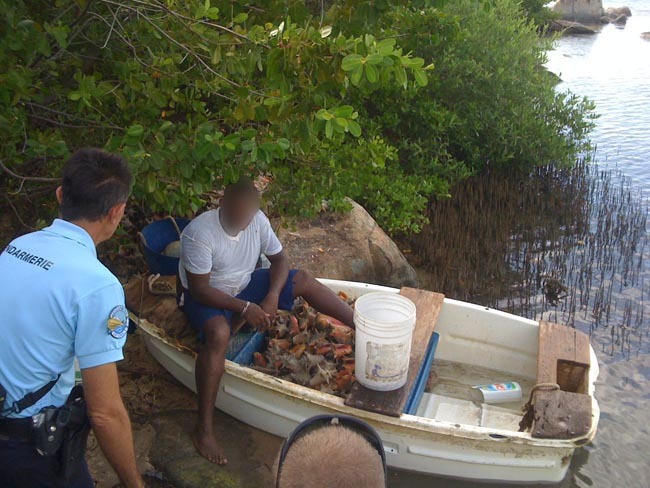 Three poachers were held accountable to the gendarmerie’s nautical brigade after rangers from the Réserve stopped them on the beach in Grandes Cayes on July 10, 2012. The three men had been fishing for sea snails at the Wilderness site and were carrying a bucket containing more than a hundred of these mollusks, in spite of the fact that fishing is prohibited in the Réserve. The sea snails were put back into the sea, and the poachers were accused of illegal fishing in the Réserve Naturelle. While awaiting their sentencing in court, they risk a fine of 1500 euros each. The Réserve Naturelle would like to remind everyone that kite surfing is prohibited in the Baie de l’Embouchure, as per an official ruling from the prefecture. In spite of this, certain individuals have not given up trying, even after several warnings by Réserve rangers. For example, a kite-surfer was caught at Galion, after he took off from the busiest part of the beach on July 10, 2012. His dossier was sent to the nautical brigade at the gendarmerie, which will convoke the offender. Shortly thereafter, on August 10, 2012, an instructor who gave kite-surfing courses at Galion, was accused for the second time for practicing a sport forbidden within the Réserve Naturelle. He was called before the nautical brigade at the gendarmerie. On July 6 off the coast near Grandes Cayes, and again on July 19 near Rocher Créole, a guard stopped two spear fishermen for illegal fishing within the marine park. Their gear, immediately seized, was returned to them the next day in exchange for a copy of a piece of identification. The fish they caught were also confiscated. Jet-skis in the Réserve: a no-no! The manager of a jet-ski rental company, out with a client aboard a second jet ski, was surprised by Réserve rangers between Pinel and the Pointe des Froussards, on September 3, 2012. A report was made and sent on to the nautical brigade. A total of 141 lionfish (pterois volitans) have been killed in the Réserve Naturelle de Saint Martin since the first one was captured on July 20, 2010. Only the Réserve’s rangers are authorized to hunt these fish with a spear gun within the boundaries of the Réserve, where they have reported the presence of mature lionfish as long as 30 centimeters (almost 12 inches). 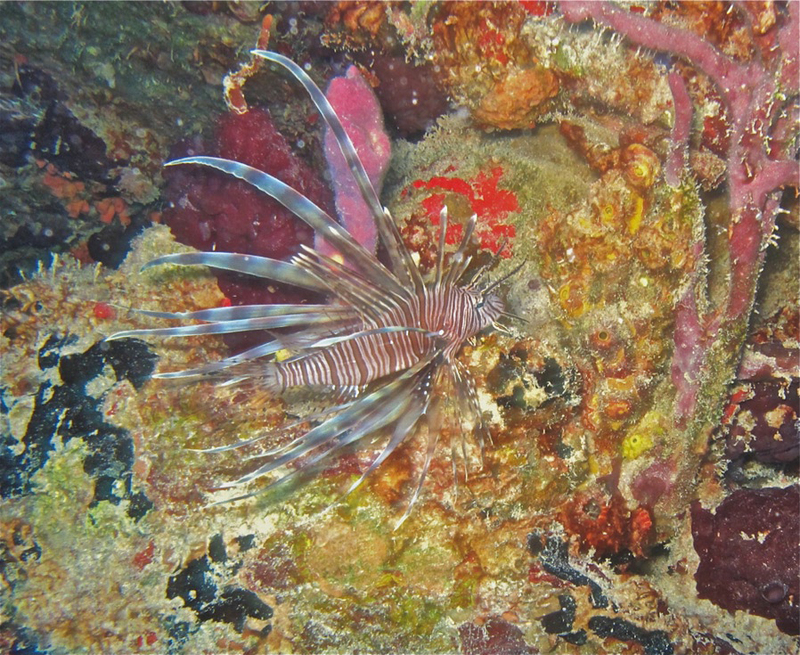 Dive clubs actively help fight the presence of this invasive specie by informing the Réserve of the exact place where lionfish have been spotted. Whether within the confines of the Réserve or not, the current practice is to cut the dead fish in two and leave it in the ocean so that other fish will feed upon it, and eventual predators will acquire a taste for the flesh of the lionfish and help diminish their numbers. The fire that started on June 12 at Eco-Site in Grandes Cayes fortunately did not spread to the Réserve Naturelle, in spite of strong winds that contributed to the expansion of the flames. The fire did however cause damage to the nearby dry forest, a zone classified as Natural of Ecological, Fauna, and Floral Interest (ZNIEFF). Thanks to unusual air currents, erratic winds brought smoke and cinders from the fire directly to Rocher Créole. Rangers took photos that they sent to the National Forestry Office (ONF) as well as to Verde, the company that manages the eco-site. The start of this fire raises the question of the risk of such fires in this sensitive zone, very close to a protected eco-system. The Réserve would like to have an anti-fire corridor around the eco-site to help stop the spread of flames. 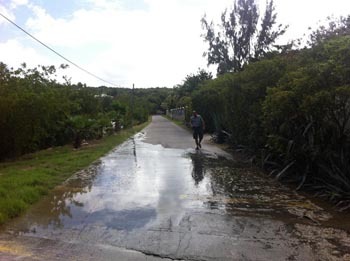 On May 21, 2012, the mechanical opening of the Chevrise salt pond to the sea, right after heavy rains, provoked major pollution in Orient Bay, hot spot of the local tourism. Thanks to eyewitnesses, the Réserve was able to confirm that a machine was used to open a passage from the pond to the sea. A formal complaint was lodged by a ranger against the suspect for breach of the law, and an administrative inquiry in underway. The ranger has a special commissioning, giving him the same power as the police in terms of fishing, as well as throwing refuse into the sea, and all other infractions of the regulations in the maritime domain, both inside and outside of the Réserve. Unauthorized execution of work that is harmful to the flow of waters or the aquatic environment is an offense under the environmental code. This offense can lead to two years in prison and a fine of 18,000 euros. Let us not forget that the Réserve naturelle is in favour of a planned and supervised opening of the ponds to the sea, to ensure the ecological continuity of these environments. Is it necessary to remind people that fishing is completely forbidden within the Réserve Naturelle? Apparently it is, since there have been five times within three months when the rangers of the Réserve reported the fishermen and seized their fishing gear. 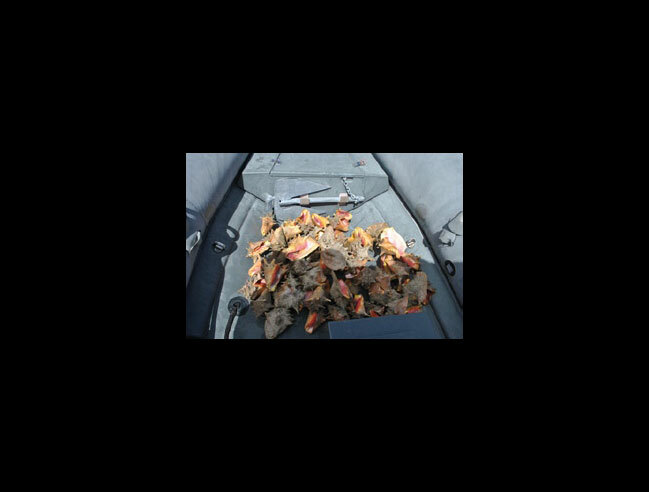 On April 4, a ranger of the Réserve surprised a fisherman who had 40 conch shells aboard his boat. As these mollusks were still alive, they were put back into the water. Conch is a protected species and totally forbidden to be fished within the Réserve. On April 6, over Easter weekend, a commercial partner of the Réserve called the rangers and alerted them that three people were aboard a boat and fishing near Caye Verte. The ranger on duty rapidly arrived on the scene by boat and saw at least 20 fish in the fishermen’s boat, including two nurse sharks, one of which was still alive, although it had been hit with a spear. Four spear guns were seized, along with scuba diving gear. The wounded shark swam out to sea after 20 minutes of oxygenation in the water. The report notes that the fishermen are guilty of an infraction worthy of a fine of 1500 euros. 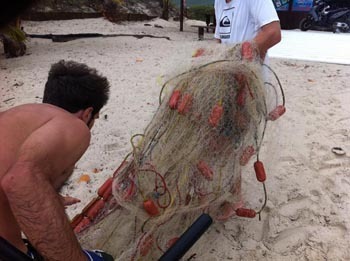 On April 18, at the Galion surf spot - Baie de l’Embouchure - three rangers of the Réserve, informed by a witness, dove into the water to retrieve a fishnet over 300 meters long. Numerous fish had already been caught in the mesh, and were freed. The question must be asked about whether these reef fish, probably carrying the ciguatera toxin, are edible or not. Where and by whom would they be sold ? Who would put their health in danger by eating them ? The net was seized and destroyed. 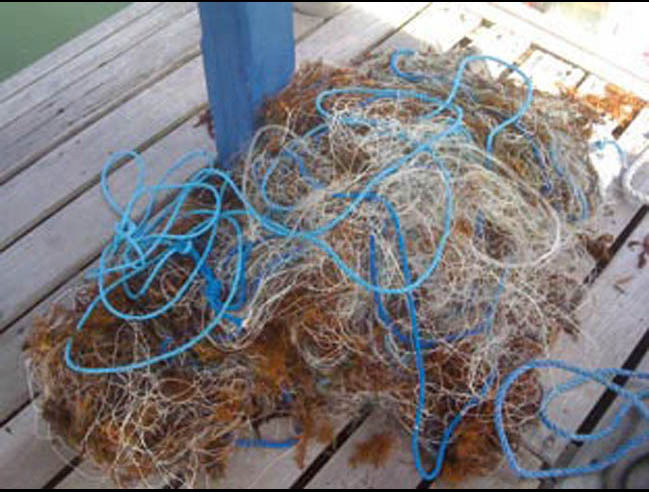 On September 9, 2011, at six o’clock in the morning, two fishermen in the act of placing a 300-meter fishnet were surprised by two maritime customs officials off the coast of Pinel during a joint surveillance operation led by the Réserve, the nautical gendarmes, and customs. On April 26, 2012, the two fishermen were judged by the court in Saint Martin, and condemned to pay a fine of 5000 euros each. Their boat, a Saintoise equipped with a 115 HP motor, was confiscated and will be sold at auction. On le sait, le sentier sous-marin de Pinel a obtenu la Palme initiative française pour les récifs coralliens (IFRECOR) 2011, à la grande fierté de la Réserve naturelle et du Conservatoire du littoral, à l’origine de la création de ce sentier unique dans la Caraïbe. Le Conservatoire a décidé de créer un nouveau sentier sous-marin en Martinique, au pied du Cap Salomon, sur la commune des Anses d’Arlet. La gestion de ce sentier sera conventionnée avec l’association SeaToyen, et plus spécialement avec Philippe Thelamon, qui gère un club de plongée non loin et sera commissionné garde du littoral en 2013. Afin de tout savoir sur la création et la gestion d’un sentier sous-marin, Philippe Thelamon – dans le cadre des compagnonnages entre gardes mis en place par Rivages de France et financés par TE ME UM – était accueilli par la Réserve de Saint-Martin du 19 au 22 juin. Il a ainsi pu bénéficier de l’expertise et des conseils techniques du garde chef Franck Roncuzzi en cette matière et a passé deux jours en binôme sur le terrain avec Isabelle Bonnefoy, gestionnaire du sentier sous-marin de Pinel. La passerelle de mise à l’eau à l’entrée du sentier sous-marin de Pinel, qui présentait des signes de dégradation et menaçait la sécurité des usagers, vient d’être remplacée par un équipement flambant neuf, en aluminium et en bois. In mid-March, 116 lionfish were captured in Saint Martin and more than 200 have been seen since they were first captured on July 20, 2010. Three victims who have been stung were admitted to the emergency ward at the hospital and lionfish have invaded the site of Rocher Créole. During the last committee meeting, Franck Mazéas of DEAL Guadeloupe (Ministry of Ecology), explained that the French West Indies are aware of the problems caused by the lionfish on other islands of the Caribbean, where as many as 80% of fish disappear in zones that are invaded by this species. This trend is negative for fishermen, business and the ecology, not to mention the risk of getting stung. DEAL hopes to employ a new regional strategy already put into place on other islands, which is to control the development of the lionfish, as its eradication is impossible, and specimens have been found as deep as 80 meters and more. The control comprises: - capture as many lionfish as possible (by authorized persons) - inform the public - warn hospitals, doctors, firemen, fishermen and dive clubs on what to do in case of a sting The more than hundred of these fish captured in Saint Martin were analyzed to see if they are edible or if they carry the toxic ciguatera, but the Marine Park in Sint Maarten analyzed lionfish from Jamaica which carried evidence of the toxin. It is no longer necessary to bring lionfish to the Réserve, as the present thinking it to cut them in half after they have been killed and leave them in the water, in order to: - provide food for other species - hope that potential predators develop a taste for them and start hunting them. 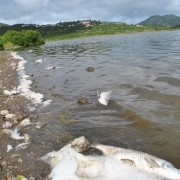 Why were there hundreds of dead fish in the Orient Salt Pond at the end of 2011? On both November 9 and December 8, the Réserve visited the site, as local residents had alerted them to the situation. The second time, a water sample was sent to the Institut Pasteur for analysis and the results were revealing: an abnormal level of enterococcus and E coli, much higher than the level found a few months earlier in a test by the Littoral Conservancy. This links the pollution to waste water from toilets. Perhaps there was a malfunction in one of the private water treatment plants or in the public system that empty into the pond? The Réserve Naturelle required the operators in question to evaluate their equipment and make any repairs that are needed. If nothing is done, the Réserve will take the necessary steps to have the situation corrected. Orient Salt Pond, part of the Réserve Naturelle, is one of the 14 ponds in Saint Martin protected by an act of the prefecture and belonging to the Littoral Conservancy. 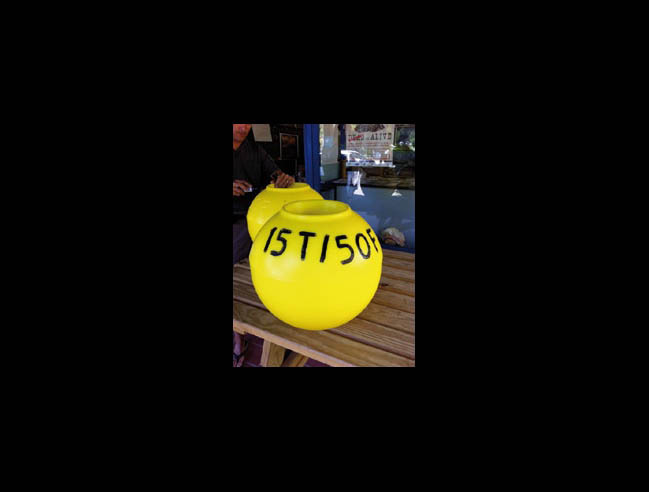 The decision to standardize the color of mooring buoys in Saint Martin, Sint Maarten, Saint Barth, Saba, and Saint Eustatia is already in effect in Saint Martin. The goal of this project, launched at an annual conference for the Northern Island in September 2011 by the managers of protected marine park zones on these islands, is to simplify communication with pleasure boaters and divers throughout the region, who will know that the yellow buoys are reserved for pleasure boats and the white ones are for dive boats. Agents from the Réserve have thus installed 17 yellow buoys on mooring blocks at Tintamare, 14 at Pinel, and 3 at Rocher Créole, for a total 34 moorings for pleasure boats. At Pinel, the six moorings stolen in 2011 have been replaced with environmentally friendly concrete blocks, made with crushed glass instead of gravel. A total of 16 white buoys are available for dive clubs: 9 at Rocher Créole (6 for dive boats and 3 for dinghies) 1 at Pinel, 1 at Caye Verte, 1 at Basse Espagnole, 3 at Tintamare, and 1 at Galion, near the surf spot. The Réserve Naturelle is keeping a close eye on the ecosite in Grandes Cayes, where most of the trash from the French side of the island is treated, close to the edge of the Réserve, just beyond the high-water mark and a few steps from the Sentier des Froussards. 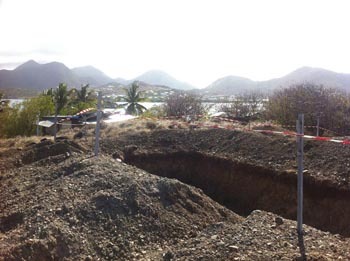 The company running the eco-site - Verde Environnement Saint-Martin - is currently studying an extension project in order to rationalize these zones and to better deal with the pollution caused by toxic liquids produced by the trash. On January 26, 2012, president Patrick Villemin took Réserve Naturelle and the Littoral Conservancy to see the site and present the project to them. After this meeting, Romain Renoux and Béatrice Galdi (from the Littoral Conservancy) sent their opinions to Villemin with an eye to limiting the risk of pollution as much as possible, as well as improve the eco-site itself, by adding landscaping, for example, at the entry to the site. The management should also remove a large quantity of vegetal debris, that has encroached onto the territory of the Réserve and choked the vegetation, and then replace what has been ruined with stricter respect of the property lines. It has also been requested to limit trash being carrying as far as the beach by the wind, to avoid pollution from toxic liquids and to ensure the quality of the marine milieus located below the areas where the trash is stocked. During the last advisory committee meeting, the question of banning kite surfing in Galion Bay was on the agenda. The Réserve manages this protected marine site according to the variety of uses - swimming, surfing, windsurfing, horseback riding, snorkeling - and is evaluating the impact of these activities on the natural environment. Romain Renoux proposed the creation of a users committee to unite the various parties in an exercise to see how each use of the bay can be taken into consideration. 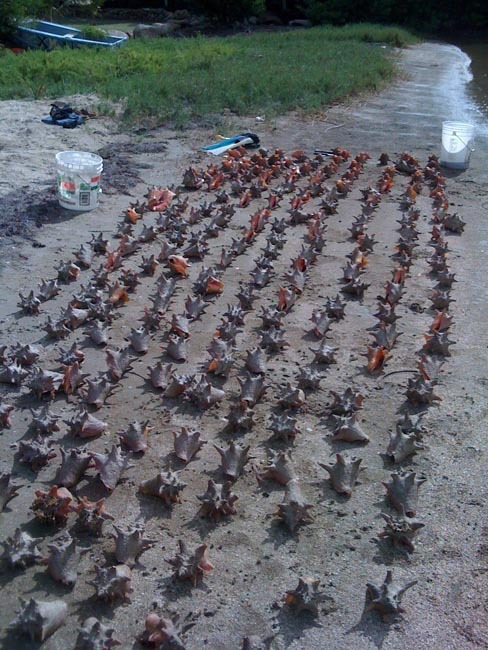 A poacher caught with 63 conchs - most of which were juveniles - just captured in Réserve Naturelle, came before the court in Saint Martin on March 8. He was accused of 11 charges and required to pay 100 euros per charge and sentenced to two months in prison, although both the fine and prison term were suspended. If he is caught poaching again, he will be required to pay the fines and go to jail. In spite of the prefectural edict banning the sport in Galion Bay, on January 16, 2012, a kite-surfer frightened a horse by coming too close to the beach and causing the rider to fall. The young woman was taken to the emergency room at the hospital. Back at Galion Bay, marine park warden Steeve Ruillet filed a complaint against the person for not respecting the ban and practicing a sport that is not allowed within the marine park. The kite-surfing gear was conditionally seized, meaning that the owner can keep it as long as he doesn’t use it within the prohibited zone. The guilty party will be called before court in Saint Martin. Only the 60 businesses having signed an agreement with the Réserve Naturelle are officially considered its partners. A dive club from the Dutch side found out the hard way after lying about a non-existing partnership in their advertising. The Réserve had previously - on two different occasions - presented a partnership dossier to the director, who did not respond. The Réserve filed a complaint against this company in Sint Maarten via the court in Saint Martin, which sent it on to Basse Terre, following the proscribed procedure for business issues with foreign entities.